When Doctor Who was resurrected in 2005, it featured actor Christopher Eccleston as the ninth incarnation of the Doctor. 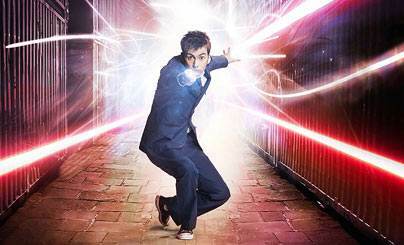 You see, as a Time Lord, the Doctor has the power to regenerate whenever mortally wounded. But it’s not as easy as that — he also changes his appearance and personality. It’s a clever way for the show to exchange actors without too much of a fuss. When Eccleston’s Doctor regenerated into the Tenth Doctor, played by David Tennant, there was a bit of an outrage. People threatened to quit watching the show, and Tennant was criticized for his portrayal of the doctor in the closing minutes of the series one finale, “The Parting of the Ways.” Over the course of the next three seasons (and eight specials), however, Tennant’s Doctor became one of the most beloved actors to ever portray the benevolent alien — he was even recently voted the best Doctor by fans. So when his time came to regenerate at the end of “The End of Time, Part Two,” there was obviously some dissonance among fans. Most were sad to see Tennant’s Doctor, whose infectious personality and trademark swagger will be badly missed. And there was still the criticism of new actor, twenty-seven-year-old Matt Smith, who came in to take Tennant’s place (however, something tells me that he’ll be as beloved as Tennant was before long). But before we look forward to see what Smith’s role as the Doctor will bring, let’s take a look back at Tennant’s Tenth Doctor, and his greatest hits. With the help of writers like Russell T. Davies and Steven Moffat (who is the new showrunner after Davies left the show with Tennant), the Doctor solved some great mysteries, and showed off his eccentricities. Let’s take a look back at the Tenth Doctor’s five greatest cases.